You will already have registered through the East Cork Harbour Marathon website but collection of your race pack will take place at Aghada GAA Grounds, Rostellan, Friday 9th August 5pm to 10pm and Saturday 10th August from 6.30am to 9am. While preferring you to pick up the race pack in person, we recognise that in some cases this may not be possible. You can nominate someone to collect your pack for you. They will require your name and date of birth and the event you are taking part in. You will then be able to pick up your Goodie Bag, T-shirt and medal after the race on the finishing line on the day. Please make sure you have your bib number with you or you won’t be able to collect it! Please take care of your running number. Do not tamper with your number in any way; note that duplicate numbers cannot be issued under any circumstances. Each full, half-marathon, and 10k participant will wear a chipped bib number; The Marathon bibs have a RED stripe. The Half Marathon has a GREEN stripe. The 10k bibs have a BLUE stripe. All participants must wear their bib on the front of their shirt. We advise you write your name, next of kin contact information and details of any health problems or medication on the reverse of the race number. The Full Marathon commences at 8.30am sharp with all full marathon walkers starting at 7.30am sharp. The Half-Marathon and 10k both start at 10am sharp. Please see our map above for start line positions of all three races. We advise all participants to be there in plenty of time. For safety and comfort, walkers in particular are advised to start towards the back of the race in the Half-Marathon and 10k. For the 10k, walkers are asked to stay on the walking path for the duration of the race. 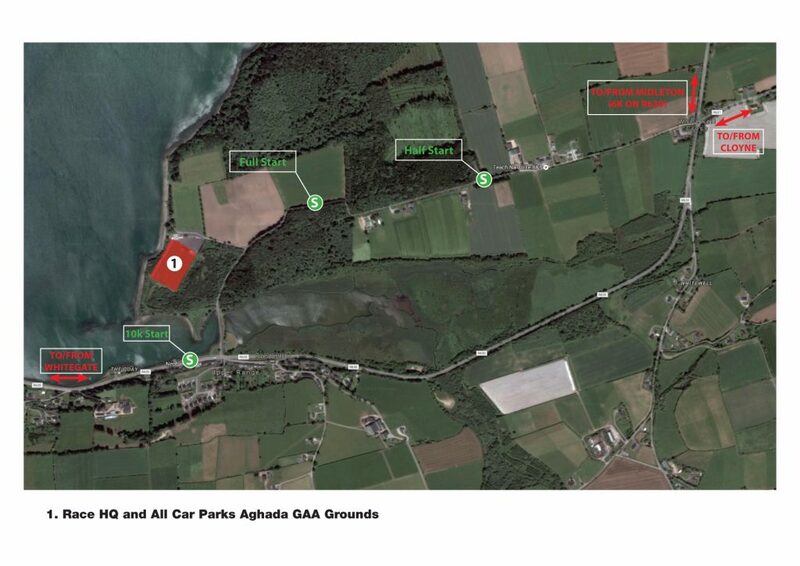 The parking facilities are within close proximity to both the start and finish of the three races. Please see map above for further details. There will be a bag drop facility in place close to the start line of all three races. If you wish to avail of this facility please ensure you write your Race Number in permanent black ink in the box provided on the bag. We accept any bag and the bag crew will tag your bag with your bib. The Bag Drop staff will take your kit bag before the race and will transport it to the finishing base at Aghada GAA grounds. When retrieving your bag at Aghada GAA grounds please have your race bib number with you in order to collect. Only one bag can be collected by a participant. We strongly recommend that you leave your valuables at home! East Cork Harbour Marathon is not responsible for lost or stolen property, including any and all property checked at the Bag Drop. East Cork Harbour Marathon accurately times runners by means of a chip on each bib provided by ‘My Run Results.com’. When you cross the start line you will run past a time gantry which will register your time as you pass. There is another time gantry at the Finish. Official results will be based on your gun time, that is the time from when the gun sounds to when you cross the finish line. Your chip time will also be recorded exactly, this being the elapsed time taken by each runner between the Start line and Finish Line. There will be no split times taken. Your chipped number will be issued to you at race pack pick up or by post if you have chosen this option on registering. You must wear it to get an official finishing time. If you do not wear your chipped number the system will not record you finishing and therefore will be unable to provide you with a finishing time. All our pacers are very experienced and most have paced many marathons or half marathons in the past. Keep an eye on facebook and the website for further details. Watch out for the team on the day sporting their pacing balloons! The course time limit is 6 hours for the Full Marathon and 4.5 hours for the Half Marathon. The race will officially close at 15.00. After this time a sweeping vehicle will traverse the course and transport all remaining athletes to the finishing base. For athletes: Please note that whilst traffic will be restricted on some roads, there will be traffic on many roads with no official road closures in place. Please remember that essential traffic will be guided through the course by the Gardaí and that there is always the possibility of traffic straying onto the course inadvertently. Note: We ask all runners to refrain from wearing headphones for safety reasons. Race vehicles and ambulances must use the course, and must be able to alert participants of their presence. For motorists: There will be a diversion through Upper Aghada for all motorists traveling to Whitegate/Trabolgan between 10.00-10.50. There will be a diversion through Upper Aghada for all motorists traveling to Midleton/Cork from Whitegate between 10.30-15.00. Whilst all roads remain open we would be very grateful if you could assist us by doing your utmost to avoid any unnecessary car journeys along the route during the race itself. We would also ask any dog owners to keep your dogs on a leash for the duration of time that athletes will be passing your house. There will be shower facilities along with separate women and mens changing rooms available at the finish at Aghada GAA grounds. If it is a warm day, please use the shower units to cool down; do not use bottled water from the Drink stations to tip over your head, as this reduces supplies for slower runners at the back of the field. There will be portable toilets at the start areas and at other locations along the route. There will also be toilet facilities available at the finish line at Aghada GAA grounds. Bottled water will be available at 10 water stations along the route and at the finish line (c. every 3 miles). The Water is plastic 250ml sports cap bottles. Energy drinks and snacks will also be available at 6 drinks station along the Full and Half route. Please discard your bottles and cups in the bins provided or to the side of the road – do not drop them on the road in front of you where they can be hazardous to runners behind you. A Drinks Station requires an adequate stretch of straight road to be set out effectively, so not all stations are immediately adjacent to mile markers. Each station will be clearly signed. Everyone who completes the full, half and 10k will receive an official limited edition East Cork Harbour Marathon T-shirt and Medal (except when the registration cut-off deadline of July 29th is missed or a runner chooses the reduced price 10k option on registering). The Race T-shirt, Medal and Goodie Bag will all be distributed at the finish line after the race. Please note that the size of t-shirt ordered on registration will be visible in the bottom corner of your race bib. Our t-shirt team will do their utmost to match your t-shirt size with the size displayed on your race bib. While participants are welcome to take part and raise funds for any charity of their choice; the charity chosen as a beneficiary of the East Cork Harbour Marathon 2019 is Marymount University Hospital and Hospice. If you require a sponsorship card for Marymount please contact them directly on 021 4501201. Note the course limit is 6 hours for the Full Marathon and 4.5 hours for the Half Marathon which means that at 3 PM the race will be officially finished and some areas of the route may even be closed for access. After 3PM a sweeping vehicle will traverse the course and transport all remaining athletes to the finishing base at Aghada GAA Grounds. The reason for this to ensure all services and facilities are available to you at the end of the event. Walkers should always move over to the side of road to allow runners to overtake. It is both frustrating and tiring for those who are still able to run to have to dodge around people who are walking. Please show consideration to your fellow competitors and walk at the side of the road. Please endeavour to walk in single file, not in groups, to give more room for faster runners to pass. There will be a sweep up vehicle which will follow the tail enders around the course. If you have to drop out you should make your way to the nearest official marshal and they will make contact with the relevant personnel depending on your requirements. The finish line is in the Aghada GAA Grounds. As you cross the finish line try to keep moving. There will be a Massage Tent if you require a massage along with a dedicated cool down area nearby. Water and hot food including tea/coffee will be available to all runners and other refreshments will be available to purchase if required. A Medical Team will be on hand for anyone requiring medical assistance. Spectators are welcome at the finishing base of the race. However, if you have family and friends coming to support you please ensure they are aware of all the traffic and parking restrictions along the route. There will be a free family fun day with games and entertainment for all ages at the finishing base of the event from 10.30am onwards. We ask that spectators follow marshals’ advice and instruction regarding access and parking for this part of the event. Participants are responsible for their recognition and understanding of event signage, symbols and colour relating to participant maps, facilities and direction. Medical personnel authorised by the event to do so may examine any participant who appears in distress. If in the sole opinion of authorised medical personnel it is in the best interest of the participant’s health and welfare, medical personnel may remove the participant from the event. Participants must retire at once from the race if ordered to do so by a member of the event’s official staff, official medical staff, or any governmental authority, including fire and police officers. Participants are responsible and assume liability for any and all medical expenses incurred as a result of training for and/or participation in the event, including but not limited to ambulance transport, hospital stays, physician and pharmaceutical goods and services. Event officials reserve the right to delay, cancel, or suspend the race due to inclement weather in accordance with Emergency Protocol. No refund will be issued in these circumstances. Any participant who refuses to obey the directions of the event official, or course marshal, or who conducts himself/herself in an unsportsmanlike manner, or who is offensive by action or language to officials, marshals, participants or spectators may be disqualified from the event and banned from future participation in the East Cork Harbour Marathon, at the discretion of race officials. Any participant who has been found by a course marshal, event official or surveillance equipment to have gained an unfair advantage by intentionally shortening the route of the race (“cutting the course”) shall be immediately disqualified from the event and banned from future participation at the discretion of race officials. Any person who participates in the event without a current official event bib number or timing device or a bib or chip not officially assigned to him/her is subject to removal and disqualification from future events. No persons are authorised to be on the course unless they are registered participants. Therefore, no person shall be allowed to accompany a participant if he/she is not registered in the event, nor shall any participant be allowed, without the permission of the event management, to receive assistance or refreshment from anyone during the progress of the event. Any person not properly displaying an authorised and issued bib number shall be directed to leave the course. A hands-on medical examination during the progress of an event by officially designated medical personnel shall not be considered assistance and will not result in disqualification if a participant is deemed medically fit. If a participant becomes ill during or after the Event and/or receives medical attention or treatment either from event medical staff, Ambulance Service or any doctor or hospital, they must authorise such persons to provide details (including details of medical treatment) to the Medical Director of the East Cork Harbour Marathon or others authorised by him/her. Event officials reserve the right, to modify, supplement or waive all or part of the event rules. Participants shall be bound by any modification or supplement of the event rules published prior to the event. Failure to follow these event rules, as may be amended, will result in immediate disqualification, loss of prizes and removal from official results. The East Cork Harbour Marathon follows, and participants are subject to, the rules specified by the Athletics Association of Ireland. Entry fee will not be refunded under any circumstance.